This stunning set includes Swarovski Christmas ball ornament, annual edition 2016 and two smaller Christmas ball ornaments. Hanging on white satin ribbons, each piece features a hand-made, mouth-blown glass ball. The larger ball features a gift package in full-cut crystal inside and a metal tag engraved with the year of issue dangling on top. An ideal gift for any special event taking place in 2016, such as a wedding, anniversary, or birth of a child. 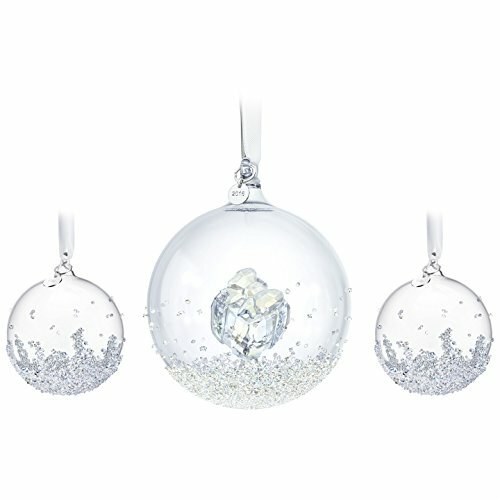 This stunning set includes Swarovski's Christmas Ball Ornament, Annual Edition 2016, and two smaller Christmas Ball Ornaments. Hanging on white satin ribbons, each piece features a hand-made, mouth-blown glass ball. The larger ball features a gift package in full-cut crystal inside and a metal tag engraved with the year of issue dangling on top. An ideal gift for any special event taking place in 2016, such as a wedding, anniversary, or birth of a child.